This course was published in the July 2018 issue and expires July 2021. The author has no commercial conflicts of interest to disclose. This 2 credit hour self-study activity is electronically mediated. Discuss how preoperative assessment and planning can help minimize adverse events associated with third molar procedures. List common complications that may arise during third molar extractions. Describe clinical techniques that can help minimize adverse events. Explain the management of complications related to these surgeries. Third molar surgery is one of the more common procedures performed by dentists and oral and maxillofacial surgeons in clinical practice. When properly planned and executed, the surgery is generally quite predictable and complications are infrequent. 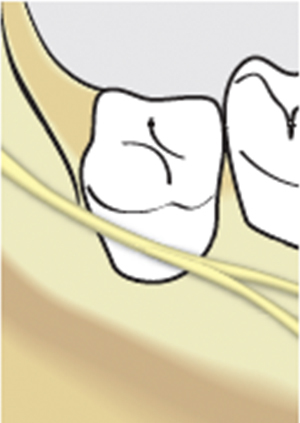 Nonetheless, complications can and do occur, and they have been reported to occur more frequently with less experienced operators.1 The purpose of this article is to review the presentation and management of the more common complications associated with wisdom tooth surgery, with an emphasis on avoidance and risk management techniques. The importance of a thorough medical workup cannot be overstated. Relative contraindications to surgery must be carefully considered.2 Extremes of age, immune deficiency states, coagulopathies, and unstable cardiac, renal or liver disease are all relative contraindications for elective third molar removal. Particularly after age 35, relative risks and benefits must be carefully weighed before proceeding with surgery. In the case of the aforementioned acute or chronic disease states, medical consultation is generally needed and patients must be stabilized prior to the procedure. Preoperatively, the operator must have a clear plan of approach and be armed with appropriate equipment and instrumentation. Furthermore, a practitioner should never operate beyond his or her comfort level. If there is any doubt about whether to do the procedure or refer, the patient deserves to be referred. In most jurisdictions, should complications arise and lead to a lawsuit, the generalist will be judged by the same standard of care as the specialist. For example, with cone beam computed tomography (CBCT) becoming more commonplace, clinicians should consider preoperative scanning3 for cases in which panoramic imaging suggests the inferior alveolar nerve may be at risk. Controversy has always surrounded the issue of prophylactic antibiotics in third molar surgery. Some research shows no clear indication or benefit,4 while a recent study notes that antibiotics decrease inflammatory complications (alveolar osteitis and/or surgical site infection).5 Thus, there is an associated dichotomy in practice patterns whereby some practitioners routinely administer prophylactic antibiotics and others do not. Since there are no standardized guidelines, it is up to the clinician to determine a standard practice, as well as a pattern of antibiotic delivery (e.g., preoperative, postoperative or both — and for what duration). However, in cases in which there is a history of prior infection, or in the presence of current pericoronitis, use of antibiotics becomes a clearer standard of care and should be routinely prescribed. Postoperative wound infection will generally occur in relatively close proximity to the surgical procedure (three to seven days). These infections may be localized and managed with antibiotics and incision and drainage, or they may progress (often quite rapidly) to a deep space infection requiring hospitalization and treatment in a hospital setting. 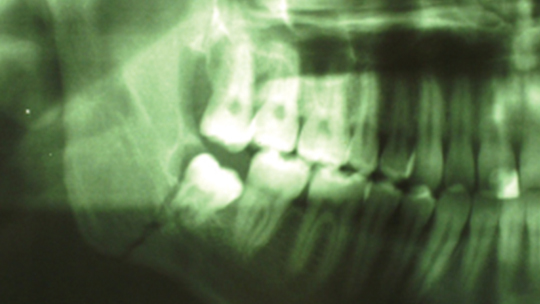 Recently, there have been multiple reports of fatal necrotizing fasciitis in previously healthy patients following routine third molar removal.6 This underscores the need for prompt recognition and management of any rapidly progressing infection following wisdom tooth extraction. Another infectious complication that is frequently missed in its early stages is osteomyelitis. This may initially have a somewhat prolonged, indolent course. Patients will present for multiple visits with variable levels of pain, sometimes preceded by alveolar osteitis, but, ultimately, radiographs will reveal bone resorption involving alveolar and basal bone (Figure 1). FIGURE 1. Early changes in osteomyelitis following third molar extraction in #17 area. The patient presented with dull pain and drainage from the extraction site. The most common cause of malpractice claims related to third molar surgery is paresthesia of the lip or tongue. Careful workup and planning is critical in preventing this complication. In cases in which the inferior alveolar canal is in direct apposition to the third molar root, CBCT may prove helpful. Radiographic signs on routine panoramic film can also be indicators of increased paresthesia risk.7 These include a darkening of the root in the area of the canal, diversion of the canal, or an interruption of the radiopaque border of the canal. Lingual paresthesia is generally more distressing for the patient than lip paresthesia. It often occurs when the operator improperly places the incision too far to the lingual aspect of the alveolar ridge. It can also occur from excessive retraction of a lingual flap, or during tooth sectioning that is carried too deeply. Clinicians should bear in mind that distal to the third molar, the lingual nerve may take a course that is very high in the alveolus (Figure 2). Written informed consent is required for third molar surgery, and should be accompanied by a face-to-face discussion so the patient truly understands the surgical risks. This way, if complications develop, the practitioner can readily “close the loop,” reminding the patient that the risk was discussed, and explaining the follow-up process. Paresthesia that is not improving within a three-month period should be referred for consultation to an oral and maxillofacial surgeon (or the consultation should at least be offered) because the chance of successful nerve repair is greater with timely intervention. FIGURE 2. Diagrammatic representation of the lingual nerve course in the third molar area. The nerve may be positioned high in the alveolus. This complication is largely avoidable, yet it remains a common cause of malpractice claims. There are cases that have been litigated or settled in which impacted second molars were removed instead of the more distally positioned third molars. The key to prevention is communication between all parties: the treating doctor, referring doctor, patient and staff. Dental staff should be empowered to speak up if they see an error in the making. They will often see what the dentist may be overlooking. There should also be a “time out” procedure in which the dentists and staff confirm the treatment about to be rendered. Counterchecks, such as marking the tooth on a radiograph, can also help prevent errors. This occurs when air emitted from a turbine-driven handpiece is forced into a surgical space. It generally presents with sudden facial swelling and soft tissue crepitus. Antibiotics are indicated to prevent infection. While usually self-limiting, there are numerous cases reported that have resulted in severe mediastinal infection, or an embolus traveling to the heart.8 Thus, it is imperative that any open surgical procedure in the oral cavity be performed with a reverse-air handpiece, rather than a standard operative handpiece that could force air into a wound. These complications should be largely avoidable, but may sometimes occur despite a clinician’s best efforts. It is imperative to protect soft tissues with adequate retraction. When using a dental elevator, always fulcrum off the alveolar bone and not an adjacent tooth. A serious injury may occur when an operator places a recently autoclaved (and still hot) handpiece against the lip, as the surgeon’s gloved hand may not detect just how hot an instrument actually is. If necessary, instruments may be cooled with sterile saline. Similar, though generally less severe, injuries can occur when an unprotected bur contacts the commissure. Proper retraction and vigilance on the part of both dentist and assistant are the keys to avoiding such injuries. Causes of wound dehiscence include undue soft tissue trauma, improper flap design, excessive tension on a flap, infection, or a compromised host. Generally, there is no specific treatment other than good oral hygiene and allowing the wound to heal by secondary intention. Attempts to reclose the wound are usually unsuccessful. Roots or root fragments can be accidentally displaced into the sinus, mandibular canal, sublingual and submandibular space, or the infratemporal fossa. One way to prevent this is to avoid excessive force — particularly force directed in a vertical direction when the root lies in direct contact with the aforementioned spaces. Retrieval of roots from the maxillary sinus, mandibular canal or deeper fascial spaces generally require management by an oral and maxillofacial surgeon. FIGURE 3. Mandibular fracture through the third molar site. Fractures of the mandible (Figure 3) and of the maxillary tuberosity (Figure 4) have been known to occur in association with wisdom tooth extraction. These complications should be quite rare if excessive force is avoided. Referral to a specialist is indicated as soon as the complication is noted. 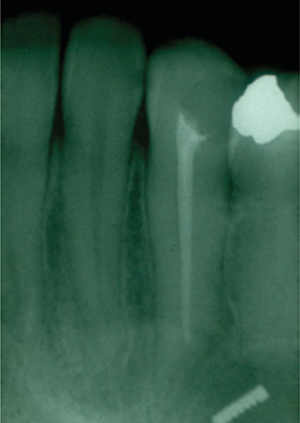 A fractured root tip requires the operator to carefully assess the relative risks of retention versus retrieval. Noninfected root fragments may be retained when, in the judgment of the surgeon, the risk of retrieval outweighs the risk of retention. This is often the case when a small root fragment remains in direct contact with the mandibular canal. Medicolegally, it is imperative that patients be advised that the root tip is being retained. FIGURE 4. Traumatic maxillary third molar extraction resulted in extensive bone and soft tissue being removed with the tooth. Bleeding can occur during or following third molar surgery, and may originate from soft tissue or bone. Intraoperative bleeding may be quite brisk, obscuring the surgeon’s view and making completion of the procedure difficult. If the extraction can be completed, it should be done quickly and efficiently. Once the tooth is out, firm pressure should be applied to the site with a gauze pack. Pressure applied for a sufficient time generally will control most hemorrhage. If the bleeding has stopped after 10 minutes, the area can be packed with an aid to hemostasis and sutured. Brisk, pulsatile bleeding from an extraction socket should raise suspicion of possible injury to the inferior alveolar nerve, and the patient should be followed postoperatively for possible paresthesia. Postoperative bleeding is managed in a similar fashion to intraoperative hemorrhage. If the patient had significant blood loss at home, clinicians should assess the physical status and vital signs, then identify the source of bleeding. Gingival bleeding can usually be controlled with sutures. Bone bleeding will require hemostatic packing as described above. If using a local anesthetic with epinephrine, the provider should observe the patient for a sufficient period before discharge because bleeding can reoccur when the vasoconstrictive effect is gone. If postoperative bleeding recurs, operators need to rule out a systemic problem or coagulopathy with a complete blood count (with platelet count), prothrombin time, and partial thromboplastin time as the initial screening tests. A bleeding time is needed to diagnose qualitative platelet problems. By far, the most common complication in third molar surgery is dry socket. The condition is most common with mandibular third molars and more common in females (especially if on oral contraceptives). Smoking, surgical trauma, and length of procedure will also predispose a patient to dry socket. It presents as a dull, aching pain, usually occurring three to five days postoperatively. Patients will often say that it “feels like a toothache.” Examination of the site will reveal complete absence of a blood clot or necrotic-looking, incomplete clot formation. There may be a fetid odor. It is important to rule out infection, so there should be an absence of fever, increasing edema or purulent drainage. If a tooth or other foreign body is presumably either swallowed or aspirated, the patient should be referred for a chest radiograph and abdominal views to confirm the location of the object. The fact that a patient had minimal or no coughing does not preclude the possibility that the object was aspirated into the lung field. If in the lung, bronchoscopy will be necessary to retrieve the object. If a tooth or small foreign body is in the stomach, it will most often pass without incident, but it is still necessary to either obtain a follow-up radiograph, or the patient needs to examine the stools to confirm passage. Erupted maxillary third molars are particularly vulnerable to being swallowed or aspirated during attempted removal. A gauze screen placed lightly in the oropharynx should be used during all extractions to minimize the risk of swallowing or aspirating a foreign body. FIGURE 5. A broken bur present within the mandibular bone. The patient was unaware of its presence. The most frequently broken instruments are burs and small elevator tips (Figure 5). If swallowed or aspirated, follow the protocol described above. If fractured and lodged in bone, a reasonable attempt should be made to localize and retrieve the remnant. If not retrieved, the patient must be informed. Sinus exposures are actually seen less frequently with third molars than with first or second molars and premolars (sometimes referred to as the antral teeth).10 If the sinus membrane is exposed, but intact, suture over the socket and prescribe antibiotics and sinus precautions (e.g., avoid forceful nose blowing or Valsalva maneuvers). A similar approach may be used for small perforations of the sinus membrane (approximately 3 mm or less). Larger perforations with obvious sinus communication will require a primary flap closure that rests over intact bone. A certain amount of trismus secondary to trauma and inflammation of the adjacent muscles of mastication sometimes occurs as a result of wisdom tooth extractions. Moist heat and anti-inflammatory medications will be helpful in management. Delayed-onset trismus should always raise the suspicion of occult infection, which must be ruled out. Perioperative and postoperative steroids or nonsteroidal anti-inflammatory drugs have been shown to reduce edema and trismus following third molar surgery. The use of a bite block is advisable to minimize trauma transmitted to the temporomandibular joints (TMJ). If a patient has preexisting TMJ pain, it is important to document that preoperatively. Persistent joint pain may require additional workup to rule out an intrinsic joint disorder. Although adequate pain control is integral to patient management, at the same time, increasing attention has been focused on the dentist’s role in potentially overprescribing opiates and, thus, contributing to the opioid crisis.11 It is important for dentists to be conservative in their prescribing habits. For simpler surgeries, nonnarcotic alternatives may suffice. Research has shown that a combination of alternating doses of acetaminophen and ibuprofen provides analgesia equivalent to many of the commonly prescribed narcotic regimens.12 In the most common protocol, 600 mg of ibuprofen is alternated with 650 mg of acetaminophen at three-hour intervals. It is also important to begin any analgesic regimen before the onset of pain, ideally before the local anesthesia wears off. With proper planning and execution, third molar surgery is generally safe and predictable. The more common complications are infection, dry socket and paresthesia — however, many others can occur and have been reviewed in this article. The incidence or severity of any complication will be minimized by thorough preoperative assessment, adept surgical technique, and timely recognition of any adverse events that may occur. Informed consent is an integral part of this process for obvious medicolegal reasons, and also because a patient who has been adequately informed of risk will accept a complication far better than the patient who had no prior explanation of relative risks. Finally, if a case appears to be beyond a practitioner’s level of comfort or expertise, referral to a qualified specialist is essential. 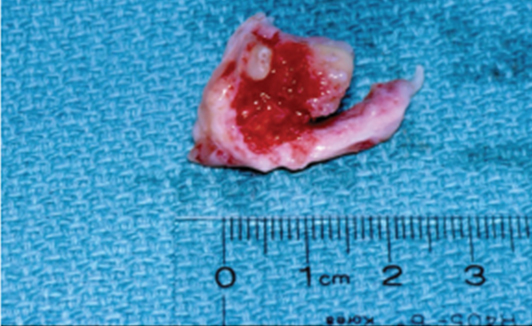 Christiaens I, Reychler H. Complications after third molar extractions: retrospective analysis of 1,213 teeth. Rev Stomatol Chir Maxillofac. 2002;103:269–274. Hupp JR, Ellis E, Tucker MR. Contemporary Oral and Maxillofacial Surgery. 6th ed. St. Louis: Mosby Elsevier; 2013. Ghaeminia H, Meijer GJ, Soehardi A, Borstlap WA, Mulder J, Bergé SJ. Position of the impacted third molar in relation to the mandibular canal. Diagnostic accuracy of cone beam computed tomography compared with panoramic radiography. Int J Oral Maxillofac Surg. 2009;38:964–971. Calvo AM, Brozoski DT, Giglio FP et al. Are antibiotics necessary after lower third molar removal? Oral Surg Oral Med Oral Pathol Oral Radiol. 2012;114(5 Suppl):199–208. Lang MS, Gonzales ML, Dodson TB. Do antibiotics decrease the risk of inflammatory complications after third molar removal in community practices? J Oral Maxillofac Surg.2017;75:249–255. Sarna T, Sengupta T, Miloro M, Kolokythas A. Cervical necrotizing fasciitis with descending mediastinitis: literature review and case report. J Oral Maxillofac Surg. 2012;70:1342–1350. Harada N, Vasudeva S, Joshi R, et al. 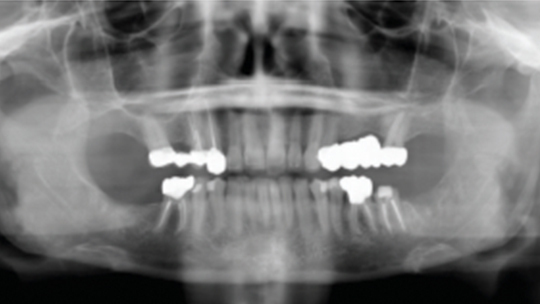 Correlation between panoramic radiographic signs and high-risk anatomical factors for impacted mandibular third molars. Oral Surg. 2013;6:129–136. McKenzie WS, Rosenberg M. Latrogenic subcutaneous emphysema of dental and surgical origin: a literature review. J Oral Maxillofac Surg. 2009;67:1265–1268. Tarakji B, Saleh LA, Umair A, Azzeghaiby SN, Hanouneh S. Systemic review of dry socket: aetiology, treatment, and prevention. J Clin Diagn Res. 2015;9:10–13. Sandhya G, Reddy PB, Jeevan KA, Reddy SB, Prasad N, Kiran G. Surgical management of oro-antral communications using resorbable GTR membrane and FDMB sandwich technique: a clinical study. J Maxillofac Oral Surg. 2013;12:254–259. Denisco RC, Kenna GA, O‘Neil MG, et al. Prevention of prescription opiod abuse: the role of the dentist. J Am Dent Assoc. 2011;142:800–810. Moore PA, Hersh EV. Combining ibuprofen and acetaminophen for acute pain management after third-molar extractions: translating clinical research to dental practice. J Am Dent Assoc. 2013;144:898–908. Lieblich SE, Isreal H, Bennett JD, Viswanath A. Analgesic efficacy and safety of Exparel (bupivacaine liposome injectable suspension) in subjects undergoing third molar surgery: preliminary results of a randomized controlled study. J Oral Maxillofac Surg. 2016;74:e42–e43. From Decisions in Dentistry. July 2018;4(7):32,35–37.